The Lope: Go Cards, Go Karma, Go L. V.! 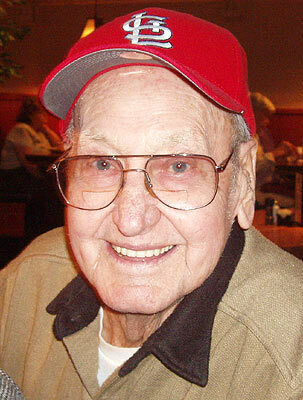 Cardinal fan L. V. Oxendine, previously saluted in Veteran's Day posts on this site, passed away in May. He was noted for his tendency to offer sage advice to coaches and managers, be they in front of him on a field or on TV. Cardinal manager Tony La Russa was a favorite target of his ire. I like to think this Cardinal victory proves that L. V. finally found some ethereal channel through which to transmit his advice - one that worked better than the phone in the dugout. 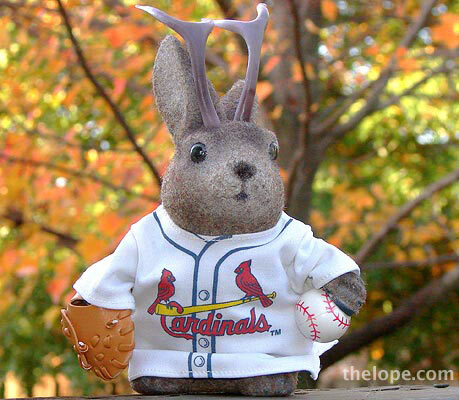 We love and miss you, L. V.
Ace wears the uniform of the St. Louis Cardinals, who last won the World Series in 2006. With all due respect to Leo Durocher, the famously combative baseball manager, nice guys don't always finish last. Sometimes, they finish first. One of the lesser-known St. Louis Cardinals, David Freese, came to Joplin in June to see the tornado damage and to show support for the people of Joplin. During the visit, the Cardinals and Kansas City Royals announced that their upcoming series of games would raise funds and awareness for the Joplin relief effort. Tonight, David Freese was named Most Valuable Player after a most improbable World Series championship for the Cards. 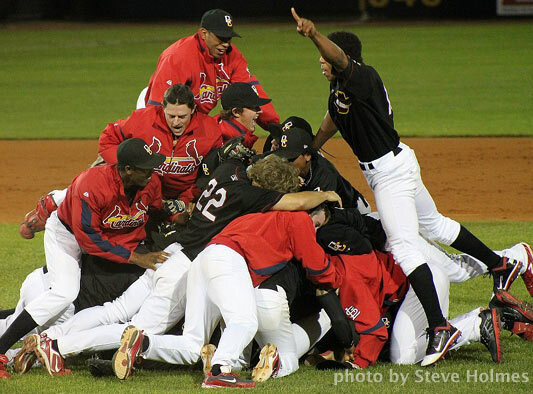 Twice in Game Six, St. Louis trailed by two runs and was one strike away from defeat. Twice. The first time, Freese's triple in the ninth drove in the tying runs and kept the Cardinals alive for another inning. His 11th-inning home run ended what some are calling the most dramatic and unbelievable World Series game of all time. I like to think that karma exists and that it noted that David Freese and his teammates were willing to go clear across the state on a day in June to show beleaguered Joplinites that people remembered and people cared. Good on ya, River Bandits. Good on ya, Cardinals. You too, David Freese.